Beth Ann & Jessica's Helpful Savings: Amazon: Kindle Fire HD 8.9" $269! 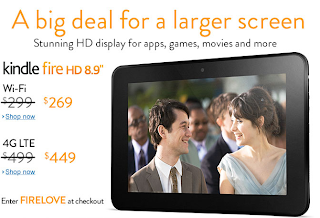 Kindle Fire HD 8.9" for $269 or the 4G LTE for $449 - with code FIRELOVE at Amazon! Limit one discount per customer, while supplies last. U.S. customers only. Discount valid on all versions of Kindle Fire HD 8.9" sold and shipped by Amazon. It does not apply to the same products sold by other sellers. Amazon reserves the right to cancel the promotion at any time. Promo codes may not be combined with other offers. 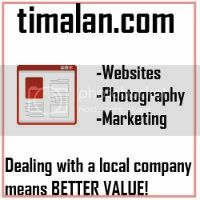 If you return items purchased using a promo code, we will subtract the value of the discount from your return credit. Offer not valid with 1-Click ordering. Void where prohibited.